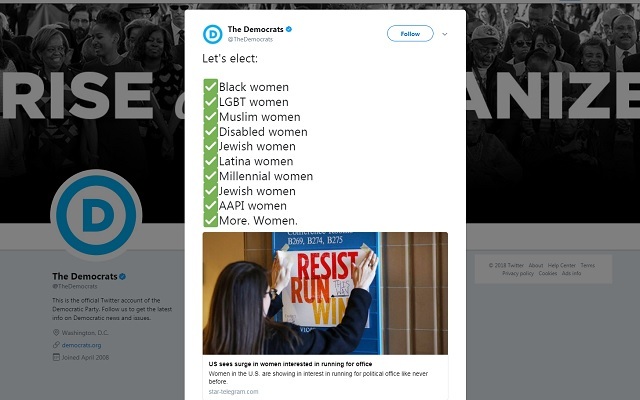 The Democratic Party wants women to be elected to office -- unless they're white and Christian. Hmmm... no Christian women? Guess they might not fit the agenda. Your inability to mention them is deafening. Not looking for conspiracies. Just noticed a blatant and obvious omission. How about we elect people based on merit?? Those best suited for the job regardless of skin color, gender, or religion? Enough with the identity politics and sowing of division. White Christian women need not apply, though Jewish women can evidently apply twice. Jewish women were mentioned twice for some reason. Are they doubly oppressed?